Chase the sun in this adventurous slot machine as you attempt to claim the riches of the land! Click here to play! 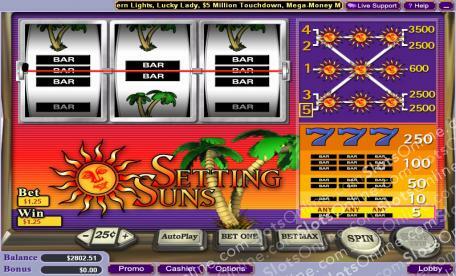 Setting Suns is a traditional 3-reel slot played across five pay lines, with the more coins played opening up more chances to win. Based on a sun theme, this simple and easy to pick up game will have you coming back for more time and time again. Beware of the Palm Trees as they are non-paying symbols, but the Setting Suns are your friend and will pay out extremely well if you manage to capture them. Depending on the number of coins you play will factor into how much you are paid out. For example, if you are only playing one coin you will receive 600 times your original wager, however, if you are wagering all five coins you will win yourself 3500 times your initial stake. Play Setting Suns today for your chance at huge cash jackpots! "Vegas Technology slots give you the option of 5, 10, 25, 50, 100, 250 or 500 auto play spins. It provides a delay between each spin between 0.25 and 2 seconds, giving you time to see exactly how much money you win each spin. Vegas Tech also gives you the ability to stop your auto spins when a jackpot is won, a single win exceeds a dollar amount, any win, an increase or decrease by a predefined amount or simply, when the number of spins are complete."